Strange things can happen to the human body when people venture into space -- and the familiar pull of gravity vanishes. August 2, 2001: Gravity hurts: you can feel it hoisting a loaded backpack or pushing a bike up a hill. But lack of gravity hurts, too: when astronauts return from long-term stints in space, they sometimes need to be carried away in stretchers. Gravity is not just a force, it's also a signal -- a signal that tells the body how to act. For one thing, it tells muscles and bones how strong they must be. In zero-G, muscles atrophy quickly, because the body perceives it does not need them. The muscles used to fight gravity --like those in the calves and spine, which maintain posture-- can lose around 20 per cent of their mass if you don't use them. Muscle mass can vanish at a rate as high as 5% a week. For bones, the loss can be even more extreme. Bones in space atrophy at a rate of about 1% a month, and models suggest that the total loss could reach 40 to 60 per cent. Blood feels gravity, too. On Earth, blood pools in the feet. When people stand, the blood pressure in their feet can be high -- about 200 mmHg (millimeters of mercury). In the brain, though, it's only 60 to 80 mmHg. In space, where the familiar pull of gravity is missing, the head-to-toe gradient vanishes. Blood pressure equalizes and becomes about 100 mmHg throughout the body. That's why astronauts can look odd: their faces, filled with fluid, puff up, and their legs, which can lose about a liter of fluid each, thin out. But that shift in blood pressure also sends a signal. Our bodies expect a blood pressure gradient. Higher blood pressure in the head raises an alarm: The body has too much blood! 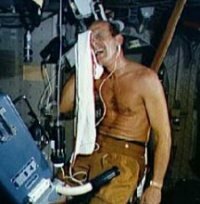 Within two to three days of weightlessness, astronauts can lose as much as 22 percent of their blood volume as a result of that errant message. This change affects the heart, too. "If you have less blood," explains Dr. Victor Schneider, research medical officer for NASA headquarters, "then your heart doesn't need to pump as hard. It's going to atrophy." The question is, do such losses matter? Perhaps not if you plan to stay in space forever. But eventually astronauts return to Earth -- and the human body has to readjust to the relentless pull of gravity. Most space adaptations appear to be reversible, but the rebuilding process is not necessarily an easy one. Above: Astronaut Susan Helms on Earth (left) and on board the International Space Station (right). "Each of the parameters have their own normal recovery time," says Schneider. Blood volume, for example, is typically restored within a few days. "Astronauts get thirsty when they come back," Schneider explains, "because their body says, you don't have enough blood in your blood vessels, and that causes the messengers to say, drink more. [Also, the body doesn't] urinate as much." Muscle, too, can be recouped. Most comes back "within a month or so, "although it might take longer to recover completely. "We normally say that it takes a day [of recovery on Earth] for each day that somebody's in space," says Schneider. Bone recovery, though, has proven problematic. For a three to six month space flight, says Schneider, it might require two to three years to regain lost bone -- if it's going to come back, and some studies have suggested that it doesn't. "You really have to exercise a lot,” says Schneider. "You really have to work at it." According to Dr. Alan Hargens, recently of NASA Ames and now a professor of orthopedics at the University of California San Diego medical school, it is important to keep astronauts in good physical condition. "You want the crew members to function normally when they come back to Earth ... and not have to lie around for long periods of rehabilitation," he says. And Earth isn't the only planet that astronauts might visit. One day humans will journey to Mars -- a six-month trip in zero-G before they disembark on a planet with 38% of Earth's gravity. "[We'll have to maintain] those astronauts at a fairly high level of fitness," explains Hargens. "When they get to Mars, there won't be anyone to help them if they get into trouble." They will need to be able to handle everything themselves. Exercise is the key. But exercising in space differs from exercising on Earth. Here, gravity's pull automatically provides a resistive force that maintains muscles and bones. "[In space] even if you do the same amount of work that you were doing down here on Earth, you miss that gravity component," says Schneider. Various devices have been developed to mimic the help that gravity provides. One Russian experiment provides resistance by strapping jogging cosmonauts to a treadmill with bungee cords. But that particular combination has not yet proven effective in preventing bone loss -- perhaps because it cannot provide sufficient loads. "The straps are so uncomfortable that the cosmonauts can only exercise at 60 to 70 per cent of their body weight,” says Hargens. There's also IRED, a NASA-developed Interim Resistive Exercise Device. IRED consists of canisters that can provide more than 300 pounds of resistance for a variety of exercises. IRED's effectiveness is still being monitored, says Schneider. Yet another promising device attempts to mimic gravity even more closely. Hargens and his colleagues are developing a Lower Body Negative Pressure (LBNP) device, a chamber that contains a treadmill, and that relies, says Hargens, on the suction of an ordinary vacuum cleaner. "We've found," he says "that we can provide body weight by applying negative pressure over the lower body." The device, explains Hargens, prevents much of the loss of cardiovascular function and of muscle. It also seems to be effective in reducing some indices of bone loss. 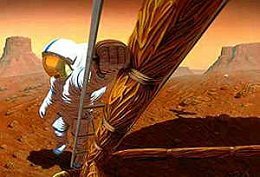 One reason is that the LBNP allows astronauts to exercise with an effective body weight between 100% and 120% of what they would feel on Earth. Another is that -- unlike any previous exercise device -- it restores the blood pressure gradient, increasing blood pressure to the legs. There's growing evidence, Hargens says, that the body's systems interact with each other. For example, "you can't just put high loads on the bone and then expect it to recover if you're not taking care of the blood flow to that bone as well." Scientists aren't yet sure how gravity "signals" the body to keep bones and muscles strong. "We know that, somehow, gravity is converted from a mechanical signal to a chemical signal -- and we know a lot about these chemical signals," says Schneider. The mechanical signals, though, remain a mystery. Solving these problems, says Schneider, could lead to better therapies for people who aren't using gravity properly here on Earth. Aging is the perfect example. Zero-G living mimics closely the effects of old age. Like astronauts, the elderly fight gravity less. They're more sedentary, which triggers the loop of muscle atrophy, bone atrophy, and lower blood volume. 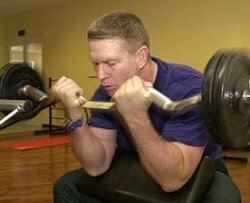 If researchers can identify the signals that generate strong muscles and bones, it might be possible "to get new pills and do exercises" that would trigger those signals here on Earth. "We've just begun to do research ... looking at the changes that can happen to humans," says Schneider. "There are so many wonderful questions." And the answers? They're waiting for us ... up there in space, where the absence of weight reminds us that gravitation isn't all bad. Sometimes it's a struggle, our daily contest with gravity, but now we know the struggle is good! Space Physiology Laboratory -- at Ames Research Center, includes information about Lower Body Negative Pressure Exercise. Renal Stones in Space? - Without the familiar pull of gravity, humans might be more likely to suffer from kidney stones. PuFF - Researchers are also checking the effects of low gravity on the lungs in this experiment aboard the International Space Station. Pedal Faster! 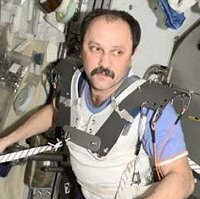 --Yury V. Usachev of Rosaviakosmos, Expedition Two mission commander, exercises on the cycle ergometer in the Zvezda Service Module on the International Space Station. NASA Research Helps Understand and Treat Osteoporosis -- learn more about bone loss on Earth and in Space from NASA's "There's Space in My Life."